Kentucky traveled to Highland Heights Tuesday afternoon looking to get back into the win column after falling to Ole Miss twice in their Saturday double-header. Kentucky scored 13 runs on 14 hits and went errorless in their 13-0 win over in-state foe Northern Kentucky. The game lasted only an hour and thirty-two minutes and was called after five innings. The Cats opened the scoring in the top of the second when Katie Reed reached on a bunt single that scored pinch-runner Jaci Babbs. 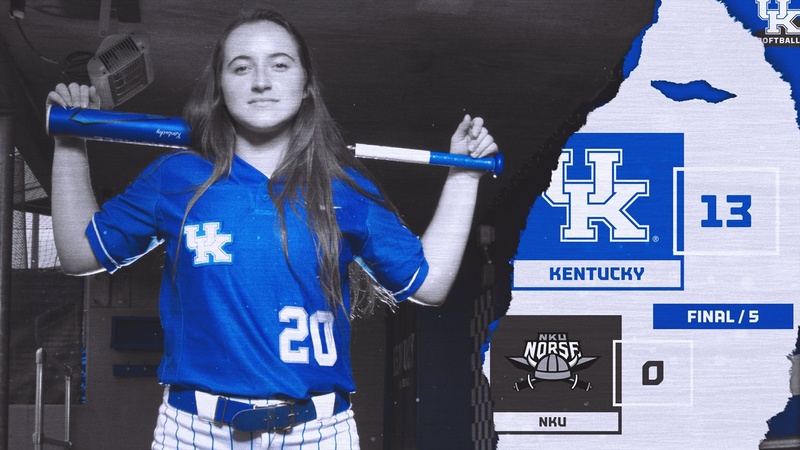 Kentucky would add two more runs in the second off sacrifice flies by Malcai Branson and Tatum Spangler, (UK 3, NKU 0). Kentucky would grab a 4-0 lead off a no-doubt shot over the wall by Abbey Cheek. Kayla Kowalik would come across to score the fifth run of the game in the third inning when she scored off an RBI groundout by Reed, (UK 5, NKU 0). The lead would gro to 8-0 off a Jenny Schaper bomb to center field and the route was officially on. In the fifth inning the Cats would add four more runs including a second home run by Schaper to put the finishing touches on the 13-0 blowout.